» On Periwinkle Creek, somebody cleaned up! On Periwinkle Creek, somebody cleaned up! This part of Periwinkle Creek below Queen Avenue looked relatively picked up on Friday, March 15. 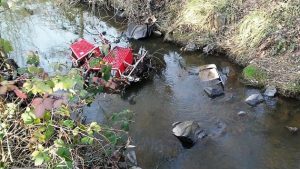 Wish I knew who got the shopping carts out of a section of Periwinkle Creek in the last few weeks. I don’t. All I know is that the debris I noticed there a couple of months ago has been removed. 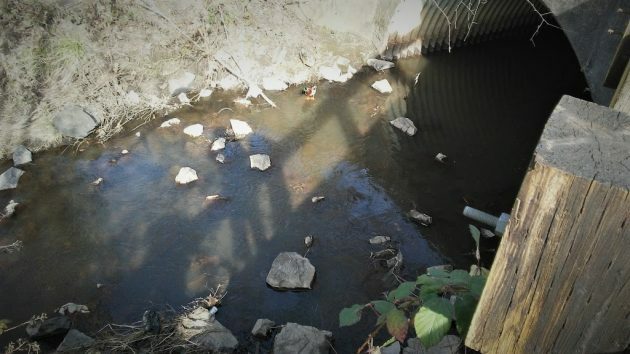 It was on Jan. 19 that a story on this site took note of the shopping carts and other junk at a spot in the creek below where it goes under Queen Avenue in a big culvert. The bike took me past the spot again on Friday, and there was good news: The two carts partly submerged in the water in January were gone. So was a folding chair that was also there back then. The carts in the creek in January. I checked with the police department’s community resource unit to see if it had organized a cleanup, as it had done under the Pacific Boulevard viaduct some weeks before. Lt. Steve Dorn, who supervises the unit, told me no, the police had nothing to do with it. He checked with the parks department, where the answer was the same. It wasn’t them. “I am assuming it was a kindly and brave citizen,” Barnett said by email. Whoever it was, somebody apparently took on the chore — before the arrival of spring-like weather over the weekend — to climb down, get in the muck at the bottom of the creek, haul those carts up the steep bank of Periwinkle Creek, and get rid of them somewhere. Very nice job! Thanks to whoever did the work! When our government lacks the will to act, it takes a citizen to get the job done! It takes a village, unless circumscribed by downtown purlieus. Then, all one needs is CARA-gium. Probably unrelated to this, but the #trashtag challenge has been a recent social media trend. People have been taking before and after photos of local clean-up projects and posting them online.